After the success of the ad for Conrad the sea lion, the zoo asked me to write a fundraising brochure. They didn't know exactly what they wanted. I toured the zoo daily for a week and interviewed people from the director and his staff on down to the train drivers and the animal feeders. Each of them had an idea of what kind of zoo the place should be. I synthesized their dreams into a single voice, into a brochure about the zoo that could come into being if they got the money to accomplish their dreams. I also read a lot of books about zoos and animals. I obtained brochures from the best zoos in the nation and cribbed freely from them. I planned the brochure as a tour of the zoo-to-be: a train tour of the proposed new exhibits. This theme was a convenient way to organize the graphics into a coherent sequence. 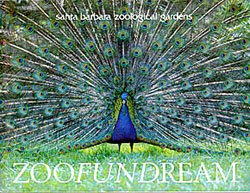 The brochure resulted in lavish donations--enough to build the new train tracks and create their new zoo.